FLEA CONTROL - "We kill what bugs you!" WHAT CAN I DO ABOUT ALL THESE FLEAS? Treating fleas in the yard can pose a big problem to the average homeowner. There are a number of factors that make calling a pest control professional a smart choice. Fleas are able to harbor in many different places outside which can make the size of the area that needs to be treated overwhelming without the right equipment. Application of the appropriate labeled pesticide and insect growth regulator at the correct intervals is the most important factor of all. Improper use of pesticides can at the least be ineffective, costly, and time consuming, and at the worst can cause serious health and environmental damage. A proper flea control program is a combination of efforts between the homeowner and the pest control professional. Tasks such as mowing the lawn to a correct length before treatment can make a big difference in the effectiveness of the treatment. Having your pet bathed and placed on a flea prevention program by their vet the same day the home and yard are being treated is also very important. Please see "Flea Pre/Post Treatment Guidelines" form in the Treatment Forms section for additional directions. 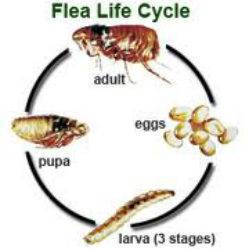 The reproductive cycle of fleas also poses a problem for a succesful treatment. Larva in their final stage of development spin a cocoon where they can live protected from adverse conditions such as pesticide for up to 20 weeks. There are other factors such a deer, raccoon, opossums, rodents, and other wildlife that may be living or traveling through your yard that will greatly contribute to a flea infestation. It is very important to eliminate any other unwanted contributors to the flea problem in order to be succesful with any flea control program. So if you find yourself faced with a flea problem or just don't want another flea problem, give us a call and we can help with prevention or control of existing problems.